"8.Though the last line of the counter states that the persons retired prior to 31.12.2014, are not entitled for the benefit of sanction of notional increment for the purpose of pensionary benefits, the same is not supported by the Government Order issued in G.O.Ms.No.311. What is not contemplated in G.O.Ms.No.311, cannot be substituted by the respondents through their counter affidavit. Going by the spirit of G.O.Ms.No.311, it is clear that prospective effect can be given only for the purpose of disbursing the monetary benefits and in respect of the eligibility, there is no cut-off date prescribed in the said Government Order. This Court is of the firm view that counter-affidavit cannot improve the contents of the Government Order issued in G.O.Ms.No.311, since no cut-off date or otherwise is contemplated in the said Government Order. 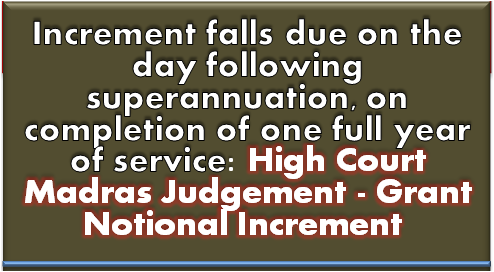 Thus, the respondents cannot substitute by prescribing that the persons retired prior to 31.12.2014, are not entitled for the benefit of sanction of notional increment." 31.12.2014, is only an acceptance of the grant of increment to the employees in G.O.Ms.No.311. Thus, there is no sanctity or relevance in respect of adopting the date of 31.12.2014, with regard to the eligibility of employees to draw their increment otherwise in accordance with the Fundamental Rules.